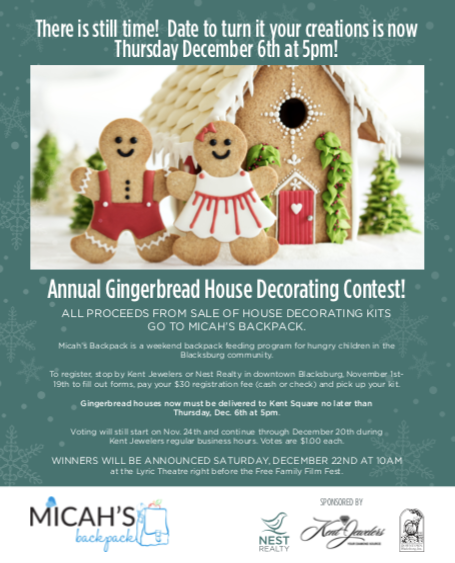 Build A Gingerbread House and Support Micah’s Backpack – NRVLiving – Real Estate. Simplified. One of our favorite fundraisers at Nest Realty every year is our annual Gingerbread House contest, supporting Micah’s Backpack. We’ve been doing it for several years now, and each year we get the question “are you doing the gingerbread houses again?” Yes! pick up your house at either Nest Realty, or Kent Jewelers. The kit is $30, and ALL PROCEEDS go to Micah’s Backpack! There are some great entrants already – what can you come up with? !